Want to come take a tour of my NEW Craft - Makeup - Office Space?! CTMH Costa Rica Incentive Trip Scrapbooked... CHECK!!! Check out this fun, girlie card using the Artiste Cricut Cartridge.. Check out this Valentine's Day Card using the Sparkle & Shine Paper Pack. Find out how you can enter to win 4 Close To My Heart Stamp Sets.. Check out this Frosted Goodie Bag to go with the Frosted WOTG Card made with the Close To My Heart Artiste Cricut Cartridge.. Heading to Costa Rica - ROYAL SUITE Style! Last Day To Enter To Win!!! Who wants to win a CTMH Cricut Collection? How about ALL 3? Find out about my July Giveaway... You don't want to miss it! Exclusive Black Friday Sale - NOW thru 11/25! It's Dotty for You Time! And a SPECIAL OFFER FROM ME! Don't miss out on my Cyber Monday Sale!!! Art Philosophy Cricut Cartridge GIVEAWAY Time Again!!! Are you dying to know who the winner is of the Art Philosophy Cricut Collection or how many flowers I used to create the Christmas Tree?!? Check out this Teacher card I made using Elemental and of course the Art Philosophy Cricut Cartridge..
Where to Buy the Art Philosophy Cricut Cartridge? New Products & Art Philosophy Cricut Collection Available Now! Technique Tuesday | Clusters, Bows, Ruffle & More! It's Technique Tuesday.. Learn about Clusters, Bows, Ruffle & More! Check out this damask card... simple, yet fun! Check out the card I made using CTMH Twitterpated for the Heart 2 Heart Challenge #4 and Practical Scrappers Challenge. Check out this Surf's Up card I made using CTMH Moon Doggie Paper. Love this set! Wahooo! I was just notified that I'm a winner of the Friday Five at Heart 2 Heart CTMH Challenges! Check out the card I made for a triple card challenge. This one qualifies for CTMH Heart 2 Heart, Mojo Monday and Practical Scrappers. Check out the spring card I made for the Heart 2 Heart CTMH Color Challenge #1 using Sunflower, Sweet Leaf and Chocolate colors. Check out the CTMH Memory Box I made for Maverick's Vintage Hawaiian Nursery using Moon Doggie Level 2 paper pack. Check out the Valentines Card I made using CTMH Jingle paper. Check out the little boy card I made using CTMH You Rock and CTMH Star Power. 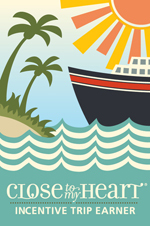 Check out my new Close To My Heart Blog Website. I just had it redesigned by www.InfinityArts.com and I LOVE it! Check out my card for the Mojo Monday Card Challenge with CTMH embrace life and CTMH veranda. Want to win some Fabulous Blog Candy from me???? Check out the Welcome Baby card I made using the new CTMH Top Stitch paper from the 2010 Spring Idea Book. Check out this 12x12 CTMH Scrapbooked Calendar I made using all Close To My Heart Products. Check out the Tri-Panel Birthday Card I created using CTMH Best Friends Forever Paper Pack with Cupcake Sprinkles Stamp Set. Check out the little gift I made for Brooklyn's kindergarten teacher using CTMH Just for the Holidays! I've been a busy bee crafting up a bunch of holiday gift tags and cards. Check out the Scrapbook page I created using CTMH Grace with the My Acrylix stamp set Childhood Portrait. Check out the Scrapbook Layouts I completed using CTMH Twitterpated. Check out the CTMH Scrapbook Holiday Layout I made using Jingle paper, Just for the Holidays stamp set and Confidential pull tags for journaling. It's a BOY!!! Check out little Maverick's ultrasound pic.... too cute! Check out 2 CTMH Christmas Scrapbook Layouts I completed with the new holiday products from Close To My Heart. Check out the 2 recent CTMH cards that I've made. Check out this Baby Shower Gift I made using Baby Payton's room colors (Black & White Damask w/ Teal and Polka Dots). Check out this CTMH More To Adore card set I made with a little paper crafted purse box. Please help by donating handmade cards for children with terminal cancer. I will be mailing mailing the cards to the Netherlands on Sept 16th to a customer who visits the children in the hospital there. Hope you can help! Check out the card I created for the CTMH Leadership Conference using CTMH Bella. Check out the quick card I made as a Congratulations on your New Baby using the CTMH Miracle My Acrylix Clear Stamp Set. Check out my Wishes inspired card using Delight In Everything From CTMH. Check out my Mojo Monday #95 card I made using CTMH Groovy Blossoms. Guest Stamper: Check out these gorgeous CTMH cards created by one of my talented downlines, Crystal Siraton. Check out the Mojo Monday #92 Card I completed using CTMH Boom Di Ada. Cute, fun & girlie for my baby cousin's birthday! Yeahh! I received my first blog award! Check out the Mojo Monday #90 Card I made using the new paper pack Bella from CTMH. Check out my Mojo Monday #88 Card using CTMH You're a Hoot Stamp Set w/ That's Amore Paper Pack. Check out the 2 scrapbook layouts I submitted for a contest and PLEASE leave a comment/vote! Lovin the new bella paper pack from Close To My Heart. Check out the card I just made with it. Check out the yummy (fake) cupcake assortment I made for my friend Deanna's new baby's room. Disount Coupons for Joann's Craft Store! Be sure and use the Promotion Code provided on the following coupons to receive 50% off, 50% off or 10% off your entire purchase. LOVE these! Check out the card I submitted for the Mojo Monday #86 Card Challenge. I used the new Bella Paper Pack & Treetops My Acrylix Clear stamps... lovin those! I am loving the Tickled Pink Promotional set for National Scrapbook Month from Close To My Heart. I used it to make my Mojo Monday #85 card..... check it out. Check out this quick card I made using the Tickled Pink stamp set. I LoVe this set.... you can even get this stamp set along with a scrapbooking kit FREE with only a $60 purchase in stamp sets during National Scrapbooking Month. I love the new Summer products Close To My Heart just released. For this card I used the new Animal Cookies paper pack & Treetops My Acrylix clear stamps... check it out. Another fabulous coupon for Joann's Craft Store! Use promotion code EED123 to receive a 40% discount. Expires Sunday, May 3rd. Check out the Thinking of you card I made for the Mojo Monday #83 Card Making Challenge using all Close To My Heart products! Check out this Desk Catty Gift Set I made for my Hostess from That's Amore paper pack from Close To My Heart & Damask Tiles clear stamps. Check out this adorable frame made with the emporium paper packet from Close To My Heart plus a matching card and mini notepad. I finally got a few scrapbook pages completed. I used the Emporium Paper Packet from Close To My Heart. Here are 2 pages for you to see. Check out my You're a Hoot card for the Mojo Monday #82 Card Making Challenge. I had some fun with frogs last night... It's my new Close To My Heart My Acrylix Stamp Set Fun Times. Check it out. 2 helpful printable coupons for Joann's Craft Store! Both coupons are for Online or In-Store. LoVe these! Here is a card to send your LoVe with an Embellished, Dry Embossed and Tiled Card. Check out this fun flower blossom tree card. Let me tell ya lots of cutting was involved for this paper crafted card. Printable Michaels Craft Store Coupons. Gotta LoVe these!!!! 30% off BONUS coupon! It's Mojo Monday time again. Check out the card I just completed for the Mojo Monday #81 Card Making Challenge. Spring is Here!!!! Check out this cute spring card I made from Close To My Heart stamps and paper packet. Here is a simple, yet elegant happy easter handmade card using the Close To My Heart Perfect Day paper packet. I just finished this completely hand stamped delight in everything card. Check out this fun and easy to make card. Check out my newly added comment section on my blog. Feel free to leave me comments and feedbacks or ask any questions you may have. Another fabulous coupon for Joanns Craft Store! Use promotion code EED098 to receive a 40% discount. Expires Wednesday April 8th. Check out the You Make Me Happy card I just completed for the Mojo Monday #80 Card Making Challenge using Close To My Heart products! Coupon time! Here is a 50% off coupon for Joann's Craft Store. Promotion code EFD092, Expires Thursday April 2nd. Here is my Mojo Monday card for Week 79. I was really happy with how it turned out. Hope you like it too! Check out this fully paper crafted box I made using the Perfect Day Paper Pack from Close To My Heart. Looks difficult but the box was easy peasy no glue needed... only for the cover and tie. I tried something new, a card purse! I was pleased with the results although it sparked new ideas for the next card purse I make. Check it out. I had so much fun with this hand stamped card using Delight in Everything My Acrylix clear stamps from Close To My Heart. Coupon time again. Here is a 40% off coupon for Joann's Craft Store. Promotion code EED086, Expires Friday March 27th. I'm in love with Love Language My Acrylix clear stamps from Close To My Heart. Here is a card I made with my new stamp set and emporium paper packet. I'm so excited for spring to arrive so I made this cute thinking of you card with spring colors. Check it out. Baby boy card made for a friend using multiple layers of designer paper, my cuddlebug with spots and dots embossing folder and my cricut animal kingdom cartridge. Check it out. Take a look at my Mojo Monday Challenge (MOJO #75), this is the 3rd Mojo Challenge I've done. The challenge was to make a project using the sketch that the Mojo Monday Blog provides. Check it out. I loved this weeks mojo monday challenge so much I made 2 cards. Check out this one I did using the Jenni Bowlin Red and Black Vintage Paper. Check out this bright and colorful birthday card I made using my spots and dots embossing folder on my cuddlebug machine, some buttons, brads, a scalloped punch, ribbon, some colorful paper and wala. Recieve 40% off with this coupon for Joann's Craft Store valid through March 7th, 2009. Check out this paper crafted card I made using my cuddlebug, fancy pants sweet spring card set, prima flowers, some other embellishments and walaaaaa! Check out this Happy Birthday card I made for my Dad. I used a technique where I stamped and dry embossed part of the card using the spots & dots embossing folder on my cuddlebug. This was for a Mojo Monday Challenge, MOJO #74. Take a look at my first Mojo Monday Challenge (MOJO #73). The challenge was to make a project using the sketch that the Mojo Monday Blog provides. Check it out. Recieve 40% off with this coupon for Joann's Craft Store valid through February 18, 2009. Check out this cute paper crafted card I made for my cousin Crissy who is here from Belgium for her Baby Shower. Just finished up this Bride to Be card for a Bridal Shower I am going to tomorrow. Check it out! Check out this fun, altered box I just finished up. It all started from a cup o' noodle box in our pantry and ended up as a perfect box for my paper crafted cards. Check out this Valentine's Day card I made. I loved using different textures of the papers and layering the tan, cream, red and black together. Valentine's Day cookie holder with matching card. This was a fun, quick and easy Valentine's Day craft project. Check it out! Check out this Paper Crafted Wall Art I made tonight of my family. Recieve 40% off with this coupon for Joann's Craft Store valid through 2/11/09. I created this boy themed, paper crafted, tag calendar for a friend of mine who is having a baby boy. I figured this would be a fun way for her to jot down memorable moments from his first year. Paper Crafted Box | Brief Tutorial | Take a looksy! Brief Tutorial on how to make this cute, fun & useful paper crafted box. It all starts with an empty oatmeal box and ends with an adorable chipboard, ribbon and flower embellished box. BIG Sale at Joann's | Check out the Goodies I got! Big sale at Joann's craft store. Scrapbooking, Stamping and Paper Crafting supplies 40% off. Showcasing my handmade card and LOVE chipboard book that inspired the design for my blog. These projects involved stamping, scrapbooking, paper crafting and embossing with flourished inkadinkadoo stamps, stampendous stamp-n stuff embossing powder, making memories sabrina paper pad, making memories pebble clicks and brazzil basic paper brads.